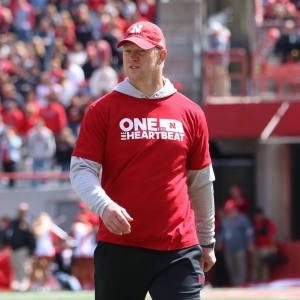 NU head coach Scott Frost said during the lead up to the spring game that they “were going to play football.” Indeed they did. Football was played at Memorial Stadium in front of an announced crowd of 85,946 fans, who saw the red team come out on top over the white team, 24-13. 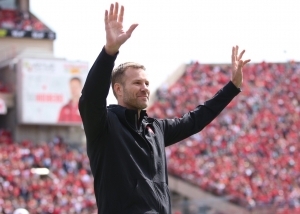 New Nebraska basketball head coach Fred Hoiberg was there. 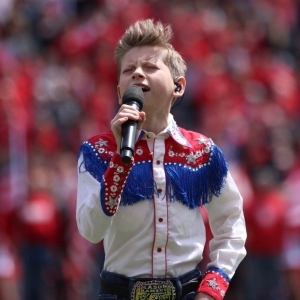 Internet sensation Mason Ramsey stopped by and so did a bevy of recruits and signees. 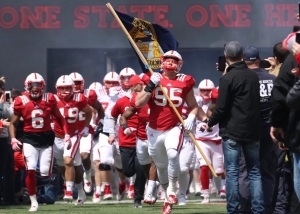 Ben Stille came charging out of the tunnel with the Nebraska state flag, a symbolic reminder of the devastating floods that have wracked the state. Dozens and dozens of veterans were in attendance. Former players littered the sidelines. At times, the environment felt a little bit more like a circus than a scrimmage. A lot of the starters were relegated to the sidelines and the game was meaningless. But make no doubt about it; Saturday’s spring game was quite the spectacle. Adrian Martinez looked sharp in his brief time on the field. He scored the first touchdown of the game on a six yard scamper. Redshirt freshman Brody Belt was technically the first to punch it in, but his touchdown was called back on an illegal formation penalty. Martinez would strike again in the second quarter, finding Jaron Woodyard in the back of the end zone on a 21 yard touchdown pass. That would be the end of his day, as Noah Vedral came in to replace him. Martinez finished 5-9 passing for 110 yards and one touchdown pass. He rushed for just one yard on six attempts, but he did have a rushing touchdown. 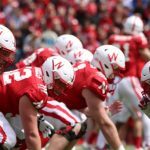 Despite Martinez’s solid performance, Frost said after the game that he was frustrated with some of their mental lapses. By halftime, they had picked up seven penalties. Martinez was in agreement with Frost over the sloppy play but was still positive about the team’s overall outlook. Vedral kept the offense clicking once Martinez’s day was done. Vedral completed 13 of his 19 attempts for 144 yards. He also picked up 17 yards on two attempts. He did throw an interception, but it took an unusual bounce off the helmet of his intended receiver which allowed Jordan Paup to snag it. Unlike the red team, the white squad was comprised mostly of backups and walk-ons that will likely not see the field much in the fall. That said a couple members of the white squad were quietly impressive. Jaylin Bradley picked up 57 yards on 12 carries for the white squad. Bradley persistently attacked the defense, averaging 4.8 yards per carry. Also, Miles Jones had 44 receiving yards on three receptions. All in all, Frost is taking everything he saw with a grain of salt. The spring game is just one more opportunity to get a look at the team.